The Republic Day Celebration was conducted at the Delta Terrain on the 26th of Jan. The Cheif Guest of the day was, Mrs.Sheela Rajan, Headmistress of the Delta Study. The student council led the march past of tge four houses. 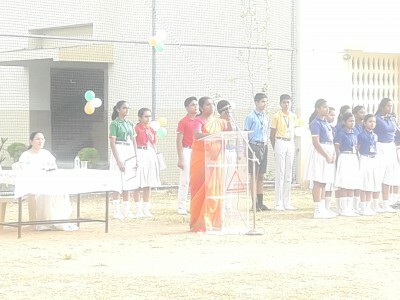 The flag was hoisted by the chief guest and she delivered the message of the day. Speeches in English and Hindi were delivered by Kunjal Ravel and Diya Khona. Patriotic songs enriched the day.